I'm usually a vodka girl, but yesterday's Cinco de Mayo celebration called for tequila! I vamoosed from work to Tijuana Taxi, where I happily indulged in a sangria-flavored margarita and 75 cent tacos during happy hour. Today I'm in more need of a siesta than a fiesta, so I bar hopped around Etsy instead and discovered handmade mixes that are as intoxicating as the real drink. 4. Sky Blue Cocktail Rim Sugar. Drink recipes and directions included by Dell Cove Spice Co.
Mmmmm. Now I'm in the mood for a delcious hibiscus margarita from my favorite local Mexican place! Yum! That hand painted pitcher is really cute. I am a nut for limes, so it is up my alley. Oh I want that hand painted margarita set! I had a blackberry margarita Thursday night that was to die for. Cheers! Love your blog! 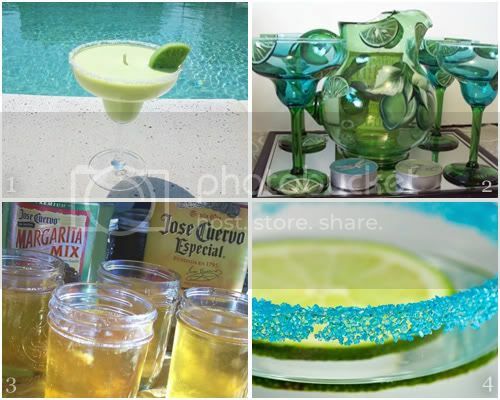 Thanks for including my handpainted margarita set. Please let your readers know that if they order through Etsy and mention your blog, they will receive a 10% discount. PS: All my glassware is dishwasher safe. Ooh I love a good margarita! Lisa, following from meet me monday blog hop! I am such a HUGE fan of margaritas! Thanks for sharing! Following you here Mrs No-No Knows site. I love the hand painted margarita glasses! Thanks for stopping by Pot of Gold Giveaways today. I'm following back.